A GAA club in Buncrana in County Donegal has become a hub for those displaced by the floods that hit the north-west last week. A number of families have not yet been able to secure accommodation, according to the club's health and wellbeing officer, Aine Daly. 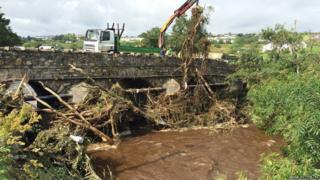 An estimated 200 homes were damaged by flood waters in Donegal. Six main bridges and many smaller ones, as well as numerous stretches of road, were damaged. Buncrana mayor Jack Murray said 47 families were still displaced while almost 300 roads were in need of repair. Gerard Gallagher, his wife and four children, are now living in a B&B in Buncrana after their house in An Griannan Park in Burnfoot was flooded. He said he has been raising concerns with the council for more than a decade but nothing had been done. "I won't be putting my children in this estate again," he said. "It is sad because it is 15 years down the drain for planning." A spokesperson for Donegal County Council said that the issue of flood defence falls "within the remit of the Office of Public Works rather than the council'." Soldiers from the Irish Defence Forces were sent to the area to help clean up both public and private properties. More than 100 people were rescued from cars and houses in Donegal, Tyrone and Londonderry after 63% of August's average rainfall fell within nine hours last Tuesday and Wednesday. Country legend Daniel O'Donnell is to play a benefit concert in aid of people in Donegal who were badly affected by the torrential rain. He will join a host of fellow country singers, including Nathan Carter, in Flood Aid for Inishowen, in Letterkenny on Saturday. All of the artists have offered their services free of charge. All proceeds, after costs, will go to the Irish Red Cross. The British Red Cross said that 22 of their volunteers had, by Sunday, helped 539 people "with practical and emotional support" in the Eglinton and Drumahoe areas of Londonderry. "We continue to support 130 people a day in the affected area," a spokesperson added.